Dieter Rams, Chief Design Officer for German consumer products manufacturer Braun AG from 1961-95, designed the neutral and unassuming L1 speaker in 1957. Influenced by Braun’s partnership with the Ulm School of Design, Rams applied the German college’s holistic approach and appreciation of systems to his design. Inge Aicher-Scholl, Otl Aicher, and Max Bill founded the Ulm School of Design in 1953 as a continuation of the Bauhaus experiment. Interestingly, at Braun Rams often worked alongside Herbert Hirche, a former Bauhaus student, and Hans Gugelot, a teacher at the Ulm School. The School integrated all disciplines with a methodology that merged design with industry, providing well-designed and functional products for all. Teachers led development groups consisting of student assistants who worked with industry partners such as Braun to develop products under market conditions. The Ulm School’s insistence that designers were responsible for providing objects of good design for consumers strongly influenced Braun and Dieter Rams. The L1 speaker is a rectangular box composed of an off-white metal housing with two rows of vertical slits on the front, and square sides of light-toned wood. Wood has a particular resonance for Rams as his grandfather was a carpenter, and Rams himself apprenticed in carpentry. Wood enclosures have better overall sound quality than metal, essential to producing a speaker that was functional as well as beautiful. The grain and warm tone of the wood also add contrast to the spare, hard-edged white metal housing and lend an aesthetic element associated with Scandinavian design of the time. In this way, the sleek speaker presents a combination of materials that are durable and can best channel sound. 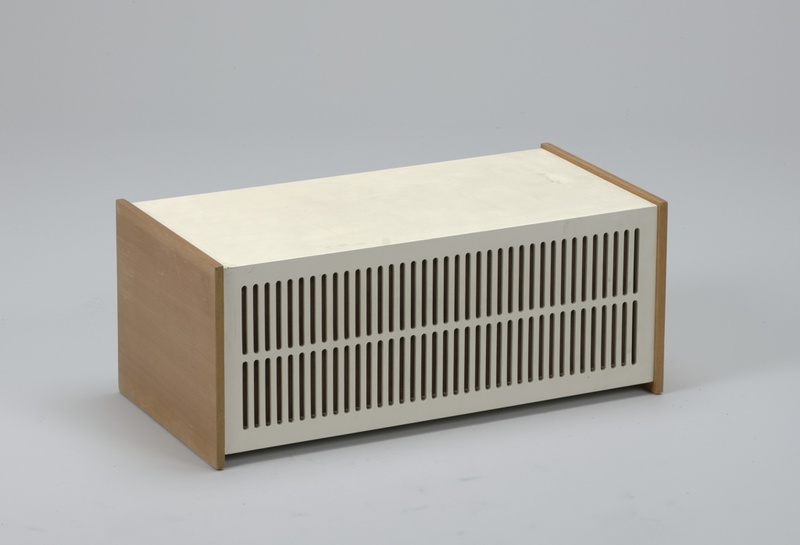 Rams used modular forms in plain white combined with wood to create suites of sound equipment—Braun’s L1 speaker could be combined with the Atelier 1 or 2 (radio and turntable) and the SK4 or SK55 (turntable and receiver). The versatility of the system allows the user to arrange and rearrange the units as desired to adapt to a changing lifestyle—three units can be stacked on top of each other, or two L1 speakers can be positioned on either side of single or stacked devices. When combined, the various pieces of the home sound system create a homogenized minimalist design that echoes flat roof architecture. Through versatile, well-designed products, Rams invites consumers to fully equip their homes with integrated Braun audio devices. Moreover, the coordinated suite reminds us how the choice of materials in audio equipment is essential in enhancing not just the day to day visual experience, but also our acoustic experience. The design of these devices emphasizes rather than conceals their functional character. Rams explained his design approach in his 1995 book entitled Weniger, aber besser which translates as “Less, but better.” Though the L1 speaker might appear plain, Rams intended the utilitarian design to liberate the owner from an environment dominated by furniture, allowing for more freedom of individual expression. By focusing on a product’s purpose rather than its embellishment, Rams contributes to a living space that is attractive and functional. Adele Bourbonne is a candidate in the History of Design and Curatorial Studies program offered at Parsons School of Design jointly with Cooper Hewitt, Smithsonian Design Museum. She is a Capstone Curatorial Fellow at Cooper Hewitt, Smithsonian Design Museum. Bernd Polster, Braun: Fifty Years of Design and Innovation (Stuttgart: Edition Axel Menges, 2009), 78.